I was registered to run the Rudolph Roundup 8k this past Sunday. I didn't end up running it. It is the first time I have ever missed a race. After my horrible performance at the Turkey Day 5k, I was concerned about finishing this race in the allotted time, but I was also excited. I was trying to look at it as a chance to run with others and to run along the lake front, neither of which I do nearly as often as I should. It also just sounded like a really fun race. I went to packet pick up a couple of days before the race. I loved that packet pick up was available at all three Fleet Feet Chicago locations, so I didn't even need to leave my neighborhood to get my packet. I was stoked that they gave out winter hats instead of the usual ill fitting race t-shirt. 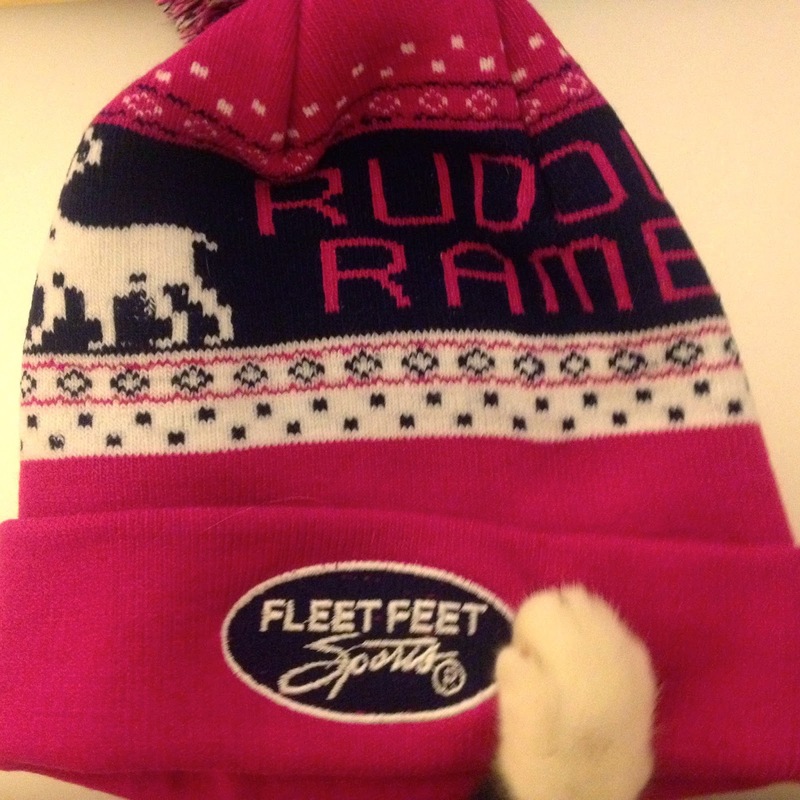 As you can tell by the kitty paw, Hannah was also a fan of the hat. I wasn't feeling great on Saturday, but I chalked it up to stress and working too much. I assembled everything I needed the night before the race and laid out the appropriate clothes, pinned my bib number to my shirt, and packed my SPI belt (I didn't want to use gear check because I was worried about finishing before gear check closed) with my id, transit card, and a little cash, and I made sure that my phone was charging. Last, but not least, I set my alarm clock to make sure that I would wake up early enough to get ready and get to the race site on time. I woke up before my alarm went off and had to make a mad dash to the bathroom before I was sick all over everything. It wasn't pretty. I didn't feel good, but I was convinced that I would be fine by the time the race rolled around. I got back into bed and hoped for the best. Unfortunately, by the time my alarm did go off, I wasn't any better. I hadn't been able to get back to sleep, and I still felt sick. I made breakfast, but I couldn't keep anything down. I tried to get ready for the race, but it was soon apparent that I would not be running that day. Being sick is never fun, but it is even worse when it causes you to miss something that you were looking forward to. My sad, unused bib number. I'm finally feeling normal again, but I'm bummed that I missed the race. I don't know if I can wear the hat in good conscience because I never actually ran the race, so maybe it is okay that Hannah keeps trying to claim it as her new cat toy. I want to make my way over to the Lakefront Trail at least once before this month is over. I may have missed my chance to run this particular 8k, but I can run an 8k distance on my own to make up for it. Ugh! The same thing happened to me the night before a goal half marathon last year .... went to bed at a reasonable time only to wake up a couple hours later and start what would be all-night puking. It was a major bummer to miss a race I worked so far for, but what can you do? I could barely leave my bed let alone run. I still wore the race shirt ... I figure I did the hard part (the training), I deserved it. I had finally decided to wear the hat (I really need a new winter hat), but my cat has pretty much claimed it as her own. She is obsessed with it and keeps finding it, no matter how well I try to hide it from her. I think she just really likes the puff ball that is on the top of the hat.